A pressure washer in your garage or workshop means you can take a car from filthy to clean in a matter of minutes, as well keep your workshop clean too. Here are ten of the best at a variety of price points. 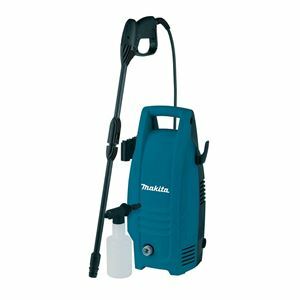 This pleasingly no-nonsense pressure washer is a typical Makita product, providing a good specification at a good price. 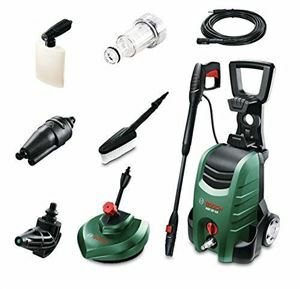 With a 1300W motor it can provide up to 100bar of water pressure, while the lance has an adjustable nozzle and a detergent bottle for adding cleaning products to its output. Bosch has a large range of pressure washers to suit a variety of budgets and tasks, but this AQT 37-13 is equipped to tackle almost anything. It has one of the most powerful motors available, with 1700W providing up 130bar of water pressure and 370 litres per hour flow rate. Included in the kit is a detergent nozzle, 90 degree nozzle for tricky jobs, a wash brush and even a patio cleaner. The big plus with this offering from Worx is that it can operate remotely, taking its power from a rechargeable battery and packing the motor all into the lance itself. Take a water feed from any suitable source via the supplied hose and you have the freedom to operate almost anywhere. As a result the water pressure is lower than conventional pressure washers at 22bar but it still has the power to tackle a range of tasks. 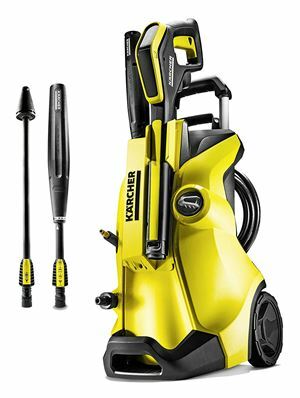 One of the most popular pressure washer brands with good reason, this K4 model from Kärcher is highly specified and adaptable too. There's a mighty 1800W motor dishing out 130bar and a flow rate of 420 litres per minute, while the lance has an LED display to indicate the right mode for the job in hand. 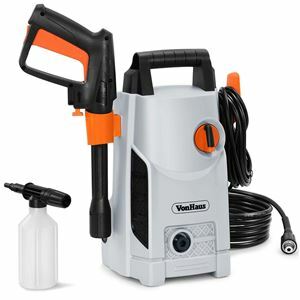 Proof that a low price doesn't necessarily mean a low feature count, this VonHaus pressure washer has a spec to rival more expensive offerings. A 1600W motor makes it one of the more powerful options and a maximum pressure of 90bar is the result. A 330-litre water tank will keep you going for hours and there's a supplied detergent bottle for adding cleaning products easily. 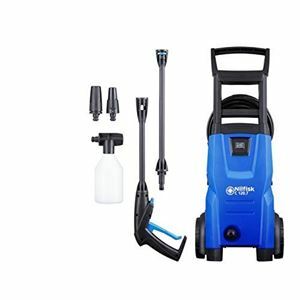 Nilfisk are not as well-known as some brands but they have a wide range of pressure washers so suit a variety of budgets and requirements. This C 120 model is one of its cheaper products but is not short on spec - a 1400W motor can provide a maximum of 120bar water pressure, while the motor is made from aluminium for reliability and light weight. 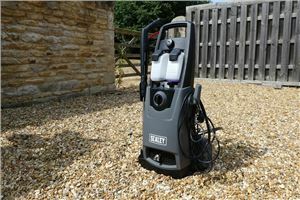 One of the highest-specification pressure washers in this list, the Sealey PW2200 is also one of biggest bargains too. A belting 1800W motor provides a strong maximum pressure of 140bar and a mamouth 400 litre per hour flow rate, while a lance and Rotoblast are included, equpping you for almost any job. 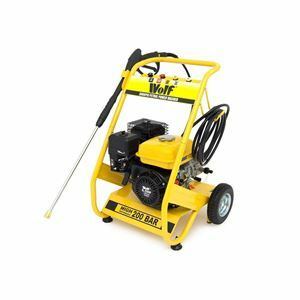 If you need a heavy-duty pressure washer that can run all day then you need a petrol-driven option like this one from Wolf. The strong 7hp motor translates to a maximum of 220bar of pressure and can run from a static water supply as well as mains for maxium flexibility. The kit includes a lance with five nozzle attachments, a six-metre hose and pneumatic off-road tyres too. 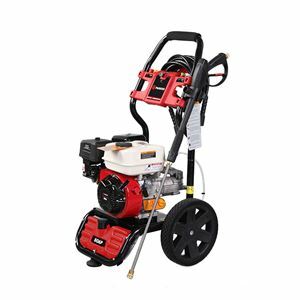 An alternative petrol-driven pressure washer for those who need the extra power, this offering from ParkerBrand has a low-maintenance four-cylinder 208cc engine pushing out 6.5hp for a maximum water pressure of 214bar. The sturdy metal frame is fitted with wheels for easy portability and a separate soap tank allows you to add detergents when needed.